Preheat the oven to 220°C, gas mark 7. Trim the ends off the ciabatta then cut it into 16 slices. Brush each side lightly with 2 tbsp olive oil and place on a baking tray in a single layer. Mix the remaining olive oil with the garlic and cherry tomatoes and a little seasoning. Spread the mixture on the slices of bread. 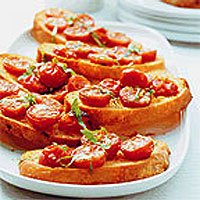 Bake for 6-8 minutes, until the bread is crisp and the tomatoes softened. Leave for at least 2 minutes before serving, to allow the tomatoes to cool slightly. Roughly shred the basil leaves, scatter over the top and serve. Prepare the ciabatta as in step 1. Then, gently fry 1 chopped clove garlic in 1 tbsp olive oil until softened. Mix with 150g sliced chestnut mushrooms and season. Spoon on top of the ciabatta and bake for 6-8 minutes until cooked. Serve garnished with 2 tbsp chopped parsley mixed with the finely grated zest of ½ lemon. Prepare the ciabatta as in step 1. Slice 200g Dolcelatte and arrange over the ciabatta. Drizzle with a little honey and place in the oven for 2-3 minutes until the cheese is warm. Serve immediately.